Video modeling is an effective tool for teaching a variety of skills to students with autism. True to its name, video modeling is pre-recorded model of an individual using a skill or completing a task. The video is presented to the learner, paired with reinforcement, and viewed on a regular schedule. Basic video modeling: This uses a peer or adult to model the behavior or skill you are trying to teach. Then the individual with autism watches the video, makes attempts at the behavior, and over time internalizes the skill or routine. Video Self-Modeling: In this type of modeling the learner is their own model. To make the recording, you prompt the learner to imitate you to complete the skill/routine. You record the process and edit out the prompts, or incomplete attempts. This process works well for classroom routines like packing or unpacking, and for academic tasks with a specific procedure like subtraction with regrouping. Video models present visual rather than auditory instruction. Video models don’t get tired, or distracted, and can be watched as often as needed. Portions of the video can be used to support forward or backward chaining procedures. To learn more about video modeling, read this. For steps to creating a video model, click here. Inspired by my colleague Allison Brown’s post about waiting, I decided to delve deeper into this subject since waiting can be one of the trickiest things to do (at least for me!). As a strategy, wait time can be powerful for autistic children. Also dubbed “the 30-second rule” or “the 45-second rule,” wait time refers to the idea of providing children with sufficient time to process information, particularly language. Research on autistic individuals shows that many have difficulty integrating information from multiple senses (e.g. 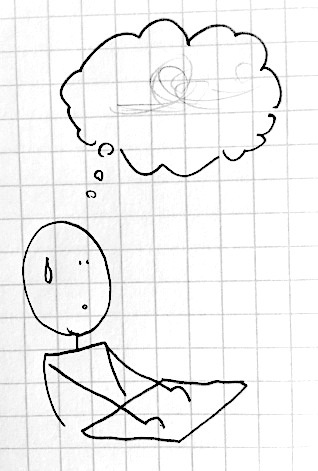 listening and looking simultaneously), particularly when the auditory information is linguistic. 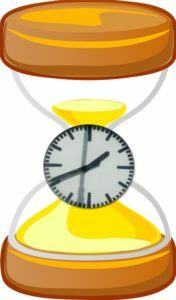 Wait time, therefore, aims to provide students with enough time to process information (particularly linguistic information), to produce linguistic information, and to process information in novel situations (which necessarily include many social situations). Wait time also allows for autistic individuals to separate the “signal” (i.e. important information) from the “noise” (i.e. irrelevant information), as studies suggest that autistic brains are both hypo- and hyper-connected when it comes to processing visual or auditory information. While this can require time, it also can mean that some individuals with autism are skilled at seeing or hearing details, that can be beneficial in many ways (e.g. for artists, musicians, designers, engineers, etc.). Scientists highlight that “the brain of a typical learner quickly allocates information-processing resources to the most salient information with minimal awareness on the part of the learner,” whereas individuals with autism require additional time to determine what is most salient or relevant. 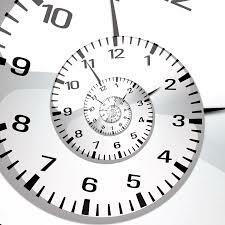 Wait time provides this time, although there are ways of supporting salience through visuals and routines as well. Some activities naturally allow for processing time: crafts, sports, and science experiments often include pauses that do not feel contrived. You can also “buy yourself time” by thinking out loud. You can model how you are thinking of solutions or what you are thinking about. For example, if you ask a math question, you can narrate, “I see the word ‘each’ so I think this is a multiplication problem, and that means I’ll set up my work like this…”(while drawing on the board). Use timers– this can help you wait “long enough,” and it signals to students when you are ready to take their responses/questions. 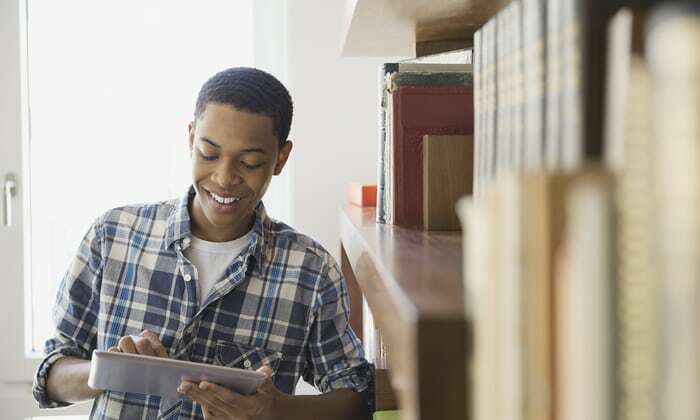 Writing: whiteboards, post-its, or other means of writing provide students with time to think and generate new ideas, allows for all students to think at once (total participation! ), and can therefore lead to increased participation. Pause while you are speaking or lecturing. While it is not ideal to bombard students with language, sometimes teachers need to speak for a few minutes here and there. While speaking, pause to allow students to think about what you have said, without requiring a question or thought, but just to allow students’ brains to reload. Share other “waiting” tricks in the comments! “Is he one of yours?” my husband asked as we waited at a bus stop. 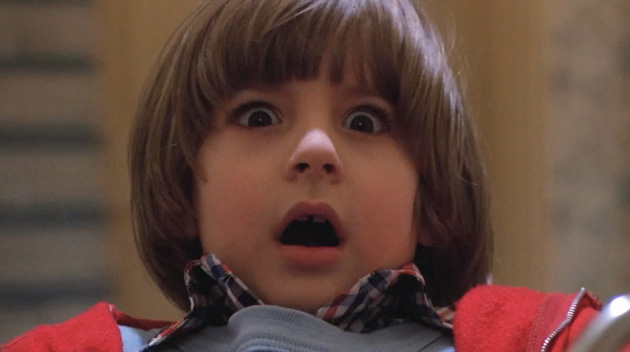 I looked up and saw one of my fourth grader’s dead in his tracks, mouth open in awe. It was indeed. We had been spotted in the wild. He approached with his mother and while the adults chatted, he stood, mouth still open in awe. As they walked away my husband chuckled and commented on the boy’s reaction to seeing his teacher out in public. “It was you he was interested in,” I pointed out. Yes, there is a certain shock to seeing your teacher beyond the context of the classroom but I kept a close eye on my kiddo during our exchange. I watched as he gave my husband a once over, then return to study each detail further. The legend that was often featured in my classroom stories had come to life. Confirmation came that Monday during morning meeting. “Is it true, does your husband like the Mets? He was wearing a Mets hat…” News spreads fast in the fourth grade and I had a wonderful opportunity for engagement and connection. It felt like a trick. Starting out a lesson with a quick story about myself, friends, or family instantly captured the attention of my class. Sharing with my students was an effortless method of engagement and made the curriculum feel relevant and relatable. It was also an opportunity to connect. Letting students learn about who you are as an individual builds trust and camaraderie. Writing personal narratives- make it a real one from your childhood. Teaching measurement- start with a picture of you cooking in your kitchen (proof that you don’t live in school!). I didn’t realize it at the time, but there was some actual science behind that engagement and connection. When we listen to stories, we activate the parts of our brain necessary for language processing but any other area in our brain that we would use when we experience the events are also activated. For example, if a story includes motion, our motor cortex becomes active. My students were engaged because that story that I was using as a hook was getting their whole brain warmed up. Sharing stories with students is a simple way to build authentic relationships and encourage students to relate. It’s an opportunity to build community by sharing an experience and inviting humor and creativity into the classroom. Plus, the look on their faces is totally worth it. 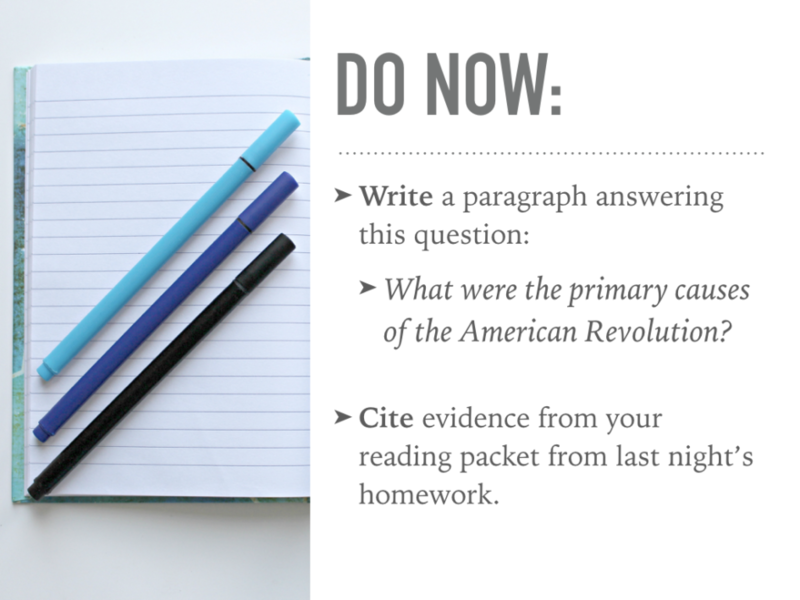 In middle and high school classrooms, the “Do Now” is ubiquitous. It is a necessary element of the lesson, with a dual purpose: 1) it gives students something to do during the start-of-class transition, and 2) it prepares them for the upcoming lesson. The directions aren’t clear, and it becomes the Do Wha? The Do Now should only take between 3 and 5 minutes. Any longer, and it cuts into valuable teaching time. Provide students with a task that gets them ready for the upcoming lesson, but doesn’t bleed into the lesson—there will be more opportunities for independent work later in the period. Do this: Usually have a Do Now that takes longer? 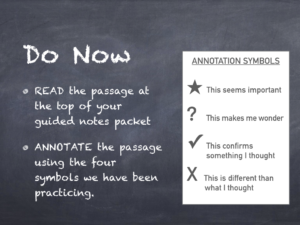 Identify a short 3- to 5-minute chunk of the task that students can complete as the Do Now, and find a place in your lesson to continue or expand on it. The Do Now should require students to do something active, and directions should state concretely what is is they should do. A Do Now like, “What were the primary causes of the American Revolution” doesn’t communicate to students that they should do anything, besides sit there and think. Always start the directions with a verb, and consider what you want to see students doing for these first 3–5 minutes. For students with ASD, the more concrete we can be with directions, the easier the directions are to follow. Do this: Brainstorm a list of a half dozen verbs that you will use to start the directions of every Do Now. Some good possibilities: write, complete, annotate, solve, jot, etc. The Do Now should be prepared and posted before students enter. Students should always know where to look to figure out what to do the second they step foot into the classroom. The Do Now also shouldn’t require an explanation—you want them to Do… NOW! The teaching comes later, when the lesson begins. Do this: Post the directions for your Do Now in the same place every day. This could be on the chalkboard, whiteboard, projected on an interactive whiteboard, or even on a sheet of paper they pick up as they enter—so long as it’s always the same. This predictability is helpful for all students, particularly those on the autism spectrum. The Do Now should be connected to the content you’re teaching. It can either be a preview or a review. A preview prepares them for what they’ll be learning in the upcoming lesson, such as a reading about a historical topic that they’ll be debating. A review helps them practice something from the previous day’s lesson or homework. This can be good for math classes, to give students another opportunity to try their hand at a recent algorithm a couple more times. Since the Do Now should be quick and doable without directions, be careful not to present brand new, potentially challenging material in the Do Now—this may cause unhelpful frustration or anxiety right at the start of the period. Do this: Decide for each lesson, what is the best way to link to what we’re doing today? Is it more helpful to review something we did yesterday, or preview something we’ll be discussing next? Short. Plan it taking no more than 3–5 minutes. Active. Tell students what to do, starting directions with a verb. Ready. Have it posted when students enter, in the same place every day. Relevant. Connect the task to the previous or upcoming lesson. 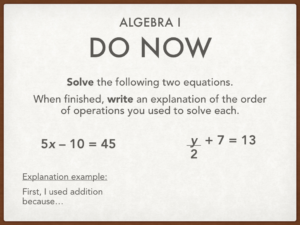 For more about the Do Now, see this post from Teach Like a Champion.